It can take years to save up enough money to build your dream home in Ghana—some people save for 10 years or more! After waiting this long, you may be in a hurry to get things started and choose a house plan without really thinking every aspect of the home through. Instead, take your time and take these factors into consideration when choosing a floor plan. Are the bedrooms grouped or separated? If you have young children you probably don’t want a floor plan with the master bedroom on one side of the home and the other bedrooms on the other side of the home. Is there enough space? You want to make sure that your existing furniture will fit. Also, if you have a large extended family that will frequently gathering in your home the size and openness of the common living space is an important factor. Can the house plan be modified? House plans that are expandable offer you more flexibility if your needs change in the future. Is the house plan engineered correctly? Once you submit your building permit application and floor plans to the Ghana Land Commission, it can take up to 3 months for approval. You want to make sure that the plans are engineered correctly so that you can obtain a permit without further delay. Do any areas of the home need to be handicap accessible? If so, you want to choose a floor plan without stairs. The doorways and hallways may also need to be wider. Is outdoor space important to you? An outdoor leisure space such as a covered porch can expand the usable square footage of your home and make it more enjoyable. For more tips and advice visit Ghana House Plans. They employ the best local architects in the business and can create the perfect floor plan for your dream home in Ghana. How Many Bags of Cement Can Build a Standard Single Room? Is It Time To Invest In Ghana Real Estate? Stay up to date! Simply fill out the forms below and we will notify you as soon as new House Plans become available, plus receive Ghana Homes house building insightful articles in your inbox. 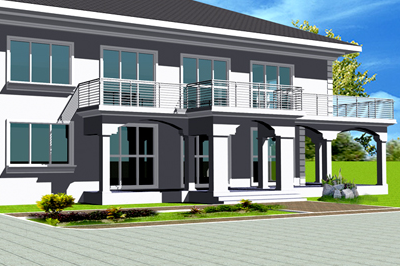 Ghana Homes provides luxury high-quality properties in Ghana . We offer state-of-the-art living conditions reflective of the rapid advancements in technology and a growing need for quality housing for both low and high income families. Our group is dedicated to a hassle free living environment in which our client can enjoy all of the benefits of a safe, attractive, and inviting property. Copyright © 2012 - GhanaHomesForSale.com - All rights reserved.